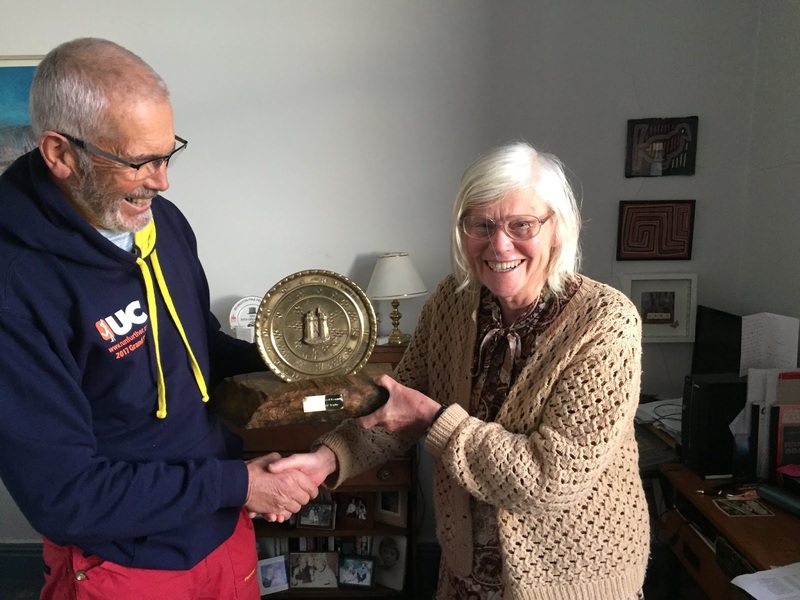 Dawn Lock, first winner of the new John o' Gaunt trophy, receives her award from Bob Nash, Street League Coordinator. The trophy will be awarded annually for the best individual performance at a nominated Lancaster area street league event when compared with their average over the season. It depicts the John o' Gaunt gate of Lancaster Castle. Results and RouteGadget for today's event are now available. Results for the junior selection race at Lancaster University on 23rd March may be viewed here. Split times are here. Start times for Sunday's event have been uploaded to SiEntries. Click here. The start list for the junior selection race at Lancaster University on 23rd March is now available. Details of the first event in the Spring Series on 30th March may be viewed here. Final details for Hampsfell are now available. SROC were victorious in the Compass Sport Trophy heat hosted by Borderliners at Bampton Common today. Results are on the BL website. Congratulations to all the counting scorers and well done to everyone for competing and demonstrating that SROC can do well even without some of our top performers! Now we start to plan for our attempt on the Trophy proper at the final on 20th October, at Pippingford Park in the South East. 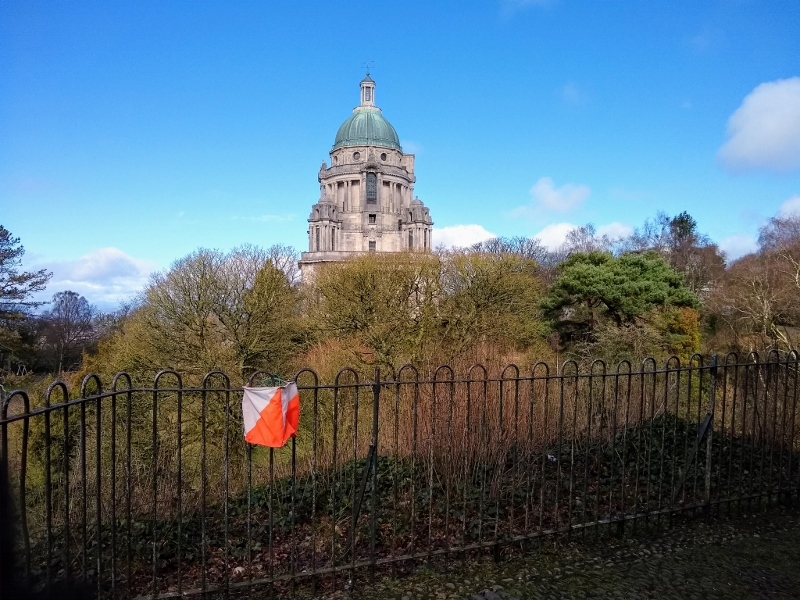 Taking into account the severe weather warning tomorrow for heavy rain and strong winds we have decided to CANCEL the Lancaster parkrun orienteering challenge at Williamson Park tomorrow, Saturday 16th March, in the interests of safety and enjoyment. We are very sorry for this but feel it is the best course of action. A replacement date will be notified in due course. If you would like to see your score in the John O' Gaunt trophy they are all here. Congratulations to newly crowned Northern Champions Heather Roome (W35), David Roome (M35) and Finlay Johnson (M18) after their success at Wharncliffe Woods yesterday. For anyone involved in the special selection race at Lancaster University on Saturday 23rd March here are the final details. The results of the Lancaster parkrun orienteering challenge are here. A great turnout (despite early rain) and some great results. Congratulations to all those who came. Come again next Saturday 16th March for another chance to orienteer, same format different controls to find! Results for event 10 at Cottam are now on-line, as are the final league tables. RouteGadget is now available for yesterday's event at Cottam, Preston. This was the last in the current series of league events however next Wednesday there will be the usual bonus event: a mass start one hour score in Freckleton, followed by the prize giving for the series. Come along, you never know you might have won one of the categories or the special trophies for Blackpool - the Tower Trophy, Preston - the Guild Trophy, or Lancaster - the new John o' Gaunt Trophy! Lancaster Parkrun Orienteering Challenge 9.30 to 10.30 Saturday 9th March, Williamson Park. Final details are on the fixtures page. Everyone welcome, whether newcomer or experienced! A reminder that Event 11, the Prizegiving, for the Street League series is 1 week after the Cottam event. Details can be found on the web here. Results for the latest event at Torrisholme are now available here. The big question is: "Who won the new trophy?" We'll have to wait until the last event of the season to find out! Next event is at Clayton le Woods on 6th February. The Morecambe area remained free of snow with just a couple of icy patches to encounter on the way round the latest night street league. RouteGadget for the event is now ready to receive your routes here. Entries are now live for the joint LOC/SROC weekend in March. See SIEntries. SROC helpers are needed for a variety of tasks. Please contact Brian Jackson to offer your help and to receive the helpers' code to claim your 50% reduction in entry fees. Preliminary details for both of these events are on the SROC and LOC websites. Joint online entry for both events is now open via SIEntries. Results for Wednesday's street league event at Standish are now available from the street league page. RouteGadget is also available. Next event is Torrisholme on 23rd January. Final details for this year's handicap may be viewed here. This is the event that everyone has a chance of winning, since you will each be given a tailor-made course to follow, calculated on your current form. It would help us if you contact the organiser in advance if you do not currently have a BOF ranking, you got a new dibber for Christmas, or you have invited a non-SROC friend to come to the event! Please email Alex Finch (alex@finchfamily.org.uk) in these cases. The Lychgate, Church Street, Standish, WN6 0JT. Please note there is limited parking at the venue, on street parking will need to be found. Please car share if possible.